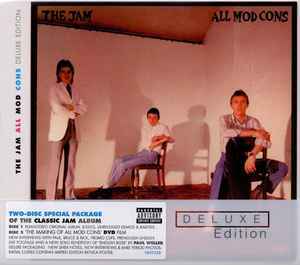 All Mod Cons was recorded between July/August/September 1978 at RAK Studios and Eden Studios. Original album released in 1978. Two-Disc Special Package Of The Classic Jam Album. Disc 1 Remastered original album, B-Sides, Unreleased Demos & Rarities. Disc 2 'The Making Of All Mod Cons' DVD Film. New interviews with Paul, Bruce & Rick, promo clips, previously-unseen live footage and a new solo rendition of 'English Rose' by Paul Weller. Deluxe Packaging - new liner notes, new interviews & rare period photos. Initial copies contain limited edition replica poster.